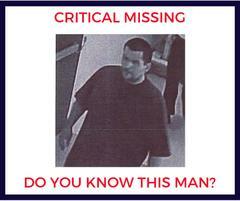 CRITICAL MISSING: Do you know this man? He may be in need of medical assistance. On October 15, 2018, at approximately 7:32 AM, the above subject entered Beverly Hospital located at 309 W. Beverly Blvd in the city of Montebello and stated that he wanted to kill himself. The subject had a laceration to the left side of his neck and was escorted to the Emergency Room of the hospital. Shortly after, the subject ran from the ER and got into a silver Chevrolet Trailblazer with a partial license plate of 5GVL and fled northbound 4th Street from the hospital and out of sight. The subject is described as a male Hispanic, 5'9" tall, weighing approximately 250lbs. wearing a dark blue shirt, blue jeans shorts, and white shoes. He has an "LA" tattoo on his left wrist and "Pico Nuevo" tattoo on the back of his neck. If you have any information that may assist the Montebello Police Department in locating and rendering aid to this subject, please call 323 887-1313.